After entering Damascus Gate you are on the street of the Arab bazaar and marketplace. There are many stores selling a wide variety of items. 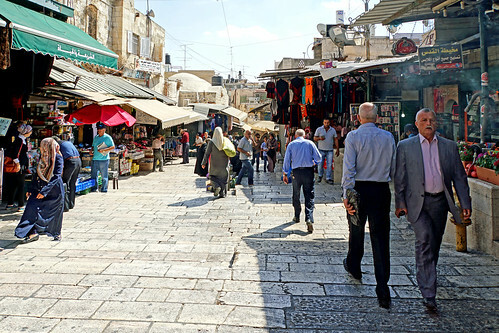 The market seems to have a thousand different items - clothing, bags, carpets, beads, embroidered Bedouin dresses, ceramics, incense, glass, leather sandals, spices, dried fruit, antiques, Christian and Jewish memorabilia, jewelry, items carved out of olive wood, sweets and much more. It was not a really busy place but great to see the lifestyle of local people going about their lives.